Collaborating with community members adds a critical dimension to social work research, providing practitioners with intimate knowledge of a community’s goals and needs while equipping community advocates with vital skills for social change. Sharing the story of one such partnership, the authors recount their efforts working with an affordable housing coalition in Philadelphia, helping activists research low-income home ownership and repair. Their collaboration helped create the Philadelphia Housing Trust Fund, which funnels millions of dollars to people in need. This book describes the origins of their partnership and its growth, including developing tensions and their diffusion in ways that contributed to the research. 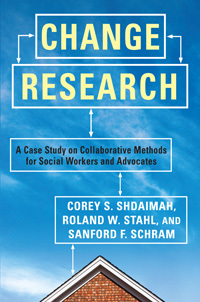 The authors personalize methods of research and the possibilities for advocacy, ultimately connecting their encounters to more general, critical themes. Building on the field’s commitment to social justice, they effectively demonstrate the potential of change research to facilitate widespread, long-term difference and improve community outcomes.